A crowd of youth and community leaders gathered to welcome Justin Trudeau as he arrived on an isolated First Nations reserve by helicopter Thursday morning. One Shoal Lake 40 elder was lifted and carried from his stationary chair to meet Trudeau on the first such visit of its kind for the prime minister. Shoal Lake 40, a community of about 250 people that sits along the border of Ontario and Manitoba, has been without clean drinking water for two decades. The daylong visit is part of an upcoming VICELAND documentary and comes amid nationwide outrage over recent suicide attempts among Indigenous youth, and deplorable living conditions on reserves across the country. There are active states of emergency in 28 First Nations communities in Ontario alone, including on Attawapiskat, where 11 people, most of them youths, tried to kill themselves in one day. Last month, the Manitoba community of Cross Lake raised the alarm over six suicides in two months. And on the very day Trudeau arrived, Kashechewan First Nation in northern Ontario declared a state of emergency over the threat of flooding that is forcing 700 people to evacuate. Earlier this year, 400 people there had to be evacuated due to mould issues in their homes. Trudeau told VICE News the visit is important because it will give him a chance to connect with and understand the people who live through these sorts of conditions. "I know all the statistics and we've seen the news reports, but being able to understand the stories, the lives, and getting to know the people who are affected by the choices that have been made over generations, and talking to them about the way forward is a way of making this much more tangible," he said. "And that's why it's so important for me to meet as many people and connect with as many people across the country as I can. Particularly here today." Trudeau, who was accompanied by 80 federal police officers and other security officials, has met with the Shoal Lake 40 chief and other community leaders, and ate a spaghetti lunch with students from the local middle school. After lunch, he will have a discussion with a group of high schoolers who have to leave the reserve to attend classes. 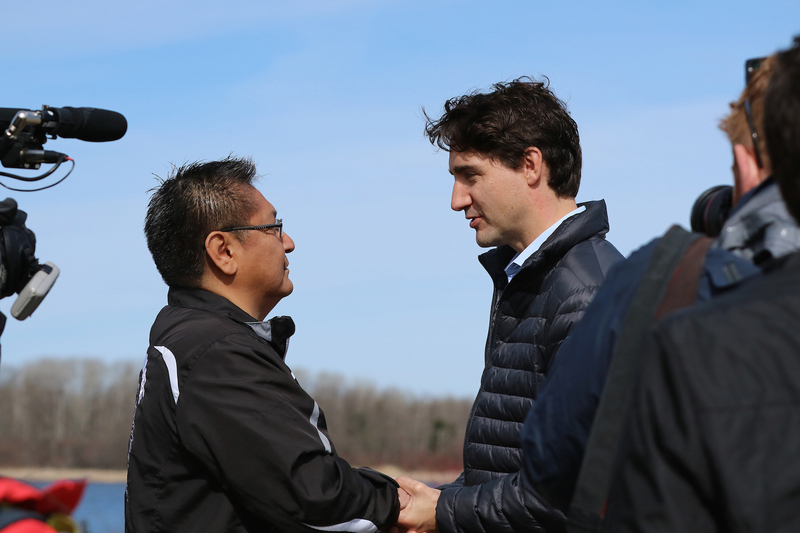 Shoal Lake 40 Chief Erwin Redsky said he hopes Trudeau leaves with "a clear plan and a clear vision of where we need to go as a country and as an Indigenous people of this land." After news broke of the prime minister's visit, Aboriginal Peoples Television Network reported that the chief of Attawapiskat, a remote First Nations community in northern Ontario, called for Trudeau to come to his community where more than 100 people have tried to commit suicide since last September. "I will encourage the prime minister to visit Attawapiskat and other First Nations that are experiencing the same problems our youth are facing," Redsky added. Shoal Lake 40 was cut off from the mainland a century ago to make room for the canal that provides drinking water for the city of Winnipeg, Manitoba. For most of the year, the community is reachable only by aging ferry or aircraft. Last year, all three levels of government committed funding to construct a permanent road to the reserve, called Freedom Road. During a VICE town hall held during the federal election campaign last year, Trudeau vowed to end all boil water advisories on reserves within five years. His government's most recent budget has allocated nearly $2 billion over five years towards this goal, although a number of First Nations experts have said more funding will be needed for it to be fully realized. Trudeau has said his government will implement all 94 recommendations put forward in 2015 from the Truth and Reconciliation Commission, which examined the legacy of the residential school system in Canada, which stripped Indigenous children from their families in an attempt to assimilate them into the dominant Canadian culture of the time. The commission called for changes to legislation on education, Indigenous language, and child welfare.